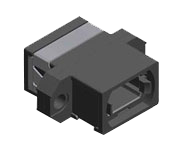 MTP Adapter Series| MPO Connectors | Fiber Optic Solutions Fujioptics Inc. US Conec manufactures durable MTP® brand adapters that provide quick connection for up to 72 optical fibers. Connection integrity is provided by adapter latches which are locked into place by a spring loaded sliding mechanism on the MTP® brand connector plug. Precision alignment is achieved with patented MTP brand connector guide pins combined with the tightly controlled guide pin holes on US Conec's MT ferrules. Numerous single port and ganged configurations are available to satisfy a variety of applications. US Conec's MTP brand adapters are fully compliant with IEC Standard 61754-7 and TIA 604-5-Type MPO.